SAVE THE DATE. You are invited! 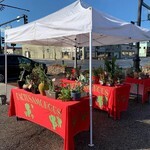 Join us April 13th for Second Saturday in beautiful Downtown Bakersfield. We will host 14+ pop-up vendors in our parking lot, INCLUDING a food truck!!! It will be a fun day Downtown- Eat. Drink. Shop LOCAL. SAVE THE DATE!! 716 19th st 93301. Vendors will be set up 10am-4pm. We will open early at 9 am, and close at 5:30pm. Enter to win our Easter GIVEAWAY! Basket will include a small prize from each of the vendors. You will be given raffle tickets with your purchases in store, and at each vendor booth.